Slim and precise micropipettes set at a fixed volume for easy dose repetition. 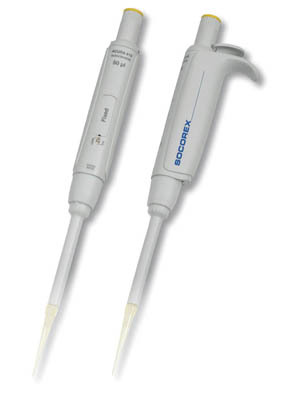 Socorex™ Acura™ Manual 815 Fixed Volume Micropipettes are easy to handle and have a soft plunger stroke. Certificaciones/conformidad ISO 8655, GMP, GLP, NCCLS, CE IVD Directive 98/79 EEC (in vitro diagnostic medical devices).